Anyone who has driven the Sea to Sky has passed by Brohm Lake – probably noticed the little wooden bridge over a marshy area and thought to themselves “why what a nice little wooden bridge” and then driven on by to better things – whistler skiing or biking or Squamish climbing or Mags 99. Or at least that’s what it was like for me. Until this winter and I got a puppy that pushed me out onto the hiking trails far more than normal. And this has become one of my favourite places to hike. There are three different routes I have taken to achieve my desired 1 – 2 hour hike. 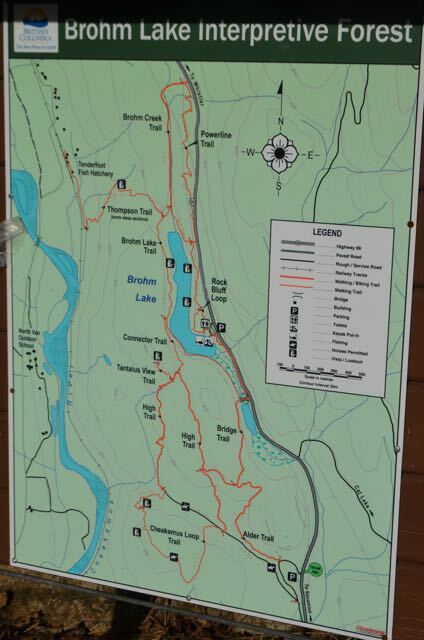 1) Around Brohm Lake – 3.3km roundtrip, thereabouts. This is probably my least favourite option here, but its a nice walk with nice views of the lake and minor elevation gain. If you want to add a few fun scramble parts include the Rock Bluffs side loop. For this hike you park in the main parking lot that is signed for Brohm Lake about 15 min north of Squamish. 2) High Trail – About 5.5km. My next adventure to Brohm Lake, I parked at the main parking lot, but headed south along the Bridge Trail and followed it onto High Trail. I followed High Trail to the wider Equestrain trail and took that to complete the loop back to Bridge trail. It was long enough as it was so I did not add Cheakamus Loop. This one has more elevation gain, but not as much as the name would suggest. You get a fantastic view of what I think is the Tantalus Range. 3) Cheakamus Loop – Again about 5.5km. More fantastic views! And probably my favourite hike here. For this variation I parked at the more Southernly parking lot (with a sign that says “Save Brohm”, fyi no left-turns into the lot) and took the Alder trail to join the Cheakamus Loop and the Equestrian trail back instead of Alder Trail just to see what happened… not much… but it’s shorter. I have yet to try the power line trail (which I hear is quite overgrown) or the one down to the fish hatchery – next time! I also hear this place gets overrun with swimmers in the summer, but it was lovely and secluded this january!